When we think about essential tools for the construction site, the circular saw makes its way somewhere toward the top of the list. As a person trying to get into the biz, it makes sense to know how to use a circular saw. The circular saw is often the tool of choice for making short, straight, clean cuts in a variety of common worksite materials, and you’ll wind up using one pretty regularly. For those of you looking to embark on a career using power tools, or even for those folks who just like to work on projects around the house, it never hurts to know how to use a circular saw. Before you make any cuts there are a few things you’ll want to handle first. As it turns out, making the cut is really only half of the battle, and there’s some prep work that will precede the fun of blasting through a board and spraying sawdust everywhere. You probably won’t need to throw on the safety gear until it comes time to cut, but it’s good to have them readily accessible for when it’s “go” time. Safety glasses keep your eyes protected from stray wood shrapnel, and a dust mask will help keep your lungs happy. It won’t hurt to have a decent pair of work gloves at the ready, and if you’ll be doing a lot of cutting, your ears will appreciate some sort of hearing protection. Of course, if the number of folks we’ve actually seen wearing safety gear with a circular saw is any indication, most of you will roll your eyes at this suggestion. When you catch a stray wood chip to the cornea, don’t say we didn’t warn you. Perhaps the first thing you’ll do will involve marking out where you intend to cut. Unless you’re comfortable with “just winging it” (and for most projects, you shouldn’t be), you’ll want to get a hold of a tape measure, a straight edge, and a pencil. Since most projects require some degree of precision, it’s best to take your time getting your measurements right. Measure twice and cut once, as they say. It will save you a lot of time and frustration in the long run. A T-square helps for drawing quick, consistent lines at a 90° to the edge of your board. 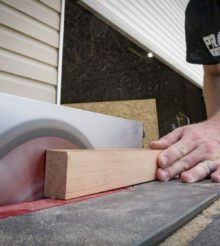 For angled cuts, a speed square can be really helpful. Once you’ve taken your measurements, you’ll want to use that straight edge to mark out a straight, bold line. Pro tip: If the material you’re cutting requires a super clean cut, try throwing some masking or painter’s tape over your cutline before you cut if you don’t have a higher tooth count blade on hand. Check out some more tips here. This is probably a mistake you would only make once, but why make it at all? Here’s a tip that will save you a ruined work table or another countertop. As you cut, your blade will extend below the bottom surface of your work material. If you have your work material resting directly on top of another surface, your circular saw blade will get caught up in surfaces you don’t intend to cut. This will damage whatever it is you’re cutting on top of. Before you make your first cut, go ahead and put your work material up on some sawhorses. If those aren’t readily available, you’ll need to find another way to elevate your material off of your table top. We like to hang our material over the edge of our work table, using clamps to hold our work material in place. Pro Tip: Sometimes you can’t avoid hitting what’s beneath your workpiece. When that’s the case, put a piece of scrap material under your cutline. This “sacrificial board” will get cut instead of what you’re cutting on top of. Although circular saw models between manufacturers will vary a bit in the way they’re laid out, the basic design elements will stay the same, for the most part. You’ll have your two handles, depth adjustment, and bevel adjustment. Generally, your depth adjustment lever will be located between the two handles, while your bevel adjustment will be located next to or on the pivoting scale at the front of the circular saw. Setting the correct depth is a matter of debate, just like it in on a table saw. It’s a better accepted that your blade depth needs to fall somewhere between 1/4″ – 1/2″ below the bottom surface of your workpiece. You can still make the cut at full depth, but you’re exposing more blade which increases the risk of injury and doesn’t use the blade as efficiently. Setting your saw at the proper depth will cause less friction between the blade and the workpiece, ultimately cleaning up the quality of your cut. It will also extend the life of your circular saw blade. So, if you’re trying to cut through a 1″-thick board, your ideal depth setting will fall somewhere between 1-1/8″ and 1-1/4″. Most circular saws include an adjustable pivot that allows you to make beveled cuts across your workpiece. To make that adjustment, you’ll need to turn the adjustment knob counterclockwise to unlock it. Then, you’ll set the angle of your cut. Be sure to lock the saw back in place by twisting the knob back tight. Finally, you’ve got everything set up, adjusted, and laid out the way you want it. You’ve equipped your safety gear and you’re finally ready to use a circular saw the way God intended: to subdue a piece of wood, laminate, sheet metal, or composite by hacking it down to size. At this point, you’ll need to line up your cut. The baseplate on your circular saw will have a notch marked “0” on it. This lines up with where your blade will cut. Most of the time, you’ll want to put the line you’ve marked out on your workpiece in this notch and keep it there as you cut. You might also notice that, next to the notch marked “0”, is a notch marked “45”. This will be the notch you’ll use to line up your cuts when you’re making a 45° bevel cut. Pro Tip: When you need to make super-accurate cuts, grab some scrap wood and note exactly where the blade kerf hits your line. Each blade will have a slightly different thickness, so making a few test lines and cuts will help you dial each one in. When you’re all lined up where you need to be, and with one hand on the front handle and one hand on the rear handle, squeeze the trigger. You’ll want to allow the blade to reach full speed. Then, you’ll push the circular saw through the cut smoothly and purposefully. Don’t force the saw through the cut. As they say, let the saw do the work. As you move the circular saw forward, the blade guard will retract from the workpiece. When you finish your cut, it will spring back into place. You can manually pull the blade guard back for making angled cuts. When you’ve completed your cut, release the trigger, and allow the blade to stop completely before moving on to anything else. That just keeps you and your workpiece from any blade damage. While we’re on the subject, you’ll want to keep your hands away from the blade when using the saw. You probably think that tip should go without saying, but you’d be surprised at how many people have lost fingers because they weren’t paying attention. When the job is done, unplug your tool, either from the wall or from the battery, and pack everything away in a cool, dry place. Pro Tip: If you’re using a lithium-ion battery, go ahead and put that pack on the charger. Lithium doesn’t suffer from battery memory like Ni-Cad does. What are some of your favorite tips on how to use a circular saw? Feel free to add them to the comments section below! Thanks for the tips. I’m starting to work with power tools after retirement from a “desk job” … and always like to start out the right way from the gitgo, learning the basics from a pro. Tip #1: Don’t buy a saw with the blade on the right unless you are left handed. That is the biggest mistake people make.